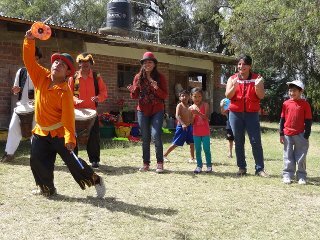 My name is Claudia Claros Cano and I work as a Sponsorship Program Implementation Officer for Save the Children in Cochabamba, Bolivia. I wanted to share with you the special celebration we hold here with our children and their families, called Family Day. 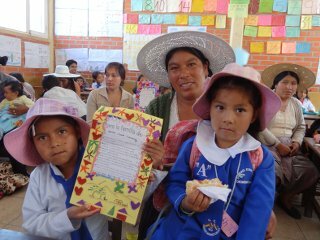 This event happens once a year and has gained special importance in the lives of the children here in Cochabamba. Family Day gives family members and their children a chance to celebrate the meaning of being a family and to spend quality time with their loved ones by participating in fun activities together. This event has been promoted by local government and organizations, and is enthusiastically supported by schools. Family Day provides hope in a community where families are the core and fundamental pillars of society. At the schools, principals and teachers work with parents to organize Family Day to include uncles and aunts, grandparents, siblings, cousins, and other relatives in enjoying reflection spaces and interactive fun and games. This allows them to share time together and learn positive messages for family life, how to preserve their families, and the importance of team work within the family. In many of the games and activities, children are active participants that guide their parents or guardians in learning helpful and meaningful family values and positive messages about family unity, while also feeling their protection and care. One of the parents participating said, "It was fun, we laughed a lot, and I saw that together with my family we are capable of doing many things if we do it together." Another parent said, "I spent a lovely day with my little boy, I wish this day was celebrated more often." Families also share an apthapi, a communal potluck style lunch. Afterwards families play sports and participate in other recreational activities. As this year's Family Day ended, families returned to their homes tired but very happy to have had the opportunity to spend a special day together and hoping to have similar opportunities in the near the future. What special memories do you have of playing, learning, and growing with your family or extended family? Do you have a special day that you celebrate in a memorable way?